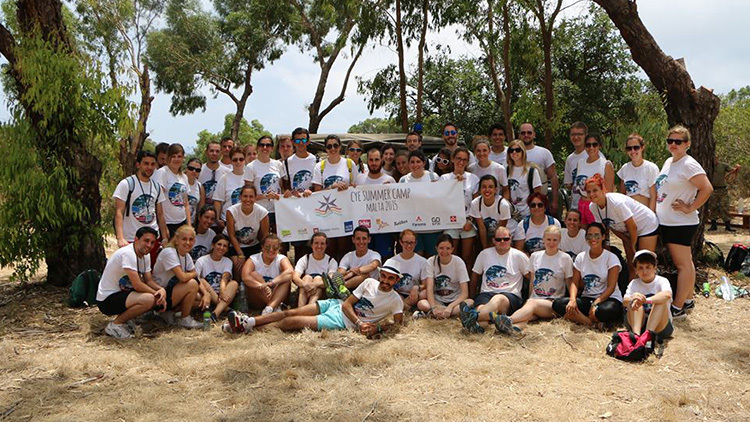 The CYE Summer Camp 2015 was held for the first time ever in Malta with the help of the Coeliac Association Malta. Our organisation team was made up of three coeliac youths: Martha Carabott, Daniel Grima and James Grima. Joining the organisers in Malta were 47 participants from 9 different countries: Austria, Greece, Italy, Norway, Slovenia, Spain, Sweden, Switzerland and The Netherlands. They stayed in a hostel in Marsaxlokk, a traditional fishing village located in the south-eastern part of the island. First day started out with welcoming everyone to Malta in Marsaxlokk. After most of the participants had arrived, an ice breaking activity was held as well as a multicultural night. During this week several different activities were held for everyone to enjoy each other’s company, enjoy sightseeing Malta and have fun! Popeye Village: Having fun at the village where the 1980 Popeye movie was filmed. Enjoying Anchor Bay, taking part in games such as tug of war, jenga and filming our own Popeye themed movie! Visit to the Armed Forces of Malta: A surprise wakeup call with two soldiers waking up everyone military style in the early hours of the morning! The participants had four different challenges to complete at their Barracks. Abseiling, Stretcher challenge and two other activities which involved a lot of teamwork and communication. Mdina: An evening to enjoy the Silent City of Malta, Mdina, through a treasure hunt at night. Traditional Sport – Regatta: A morning at a traditional regatta club to learn about the traditional sport, competition with rowing machines and rowing a traditional Maltese regatta boat. The participants had a small tour of the President’s Palace, San Anton Palace, and a wonderful opportunity to meet with Her Excellency the President of Malta, Marie Louise Coliero Preca who gave a short speech about the challenges coeliacs face on a daily basis. A few parties were organised to enjoy each other’s company in the best way possible. These parties included a beach party, a boat party as part of our boat trip to Comino and a glow in the dark party. To view more photos and videos visit the event’s Facebook page.